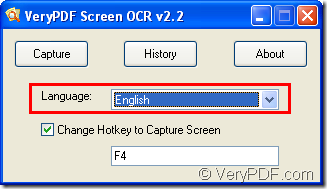 ← Do you know how to OCR Screen conveniently? Do you want to recognize text from a scanned PDF document and then save the text as TXT document? 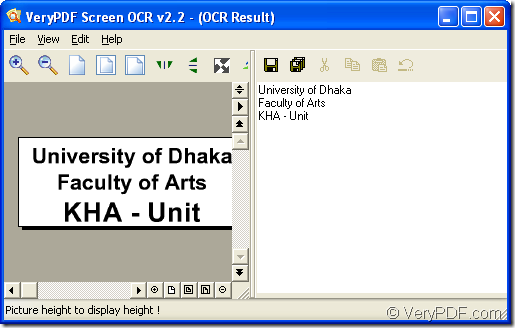 If so, the program VeryPDF Screen OCR which has the capacity to recognize text on computer desktop, image, icon, file pages, webpage, etc. will do you a great favor. Before using the program, please download the program to your computer by clicking here. It is easy to install and run the program. You just need to double click the software installer and then follow the setup wizard to finish the installation step by step. To run Screen OCR program, you need to double click its icon or run it through Start menu. To recognize text in your scanned PDF document, you need to open the document and then find the text area that needs to be recognized. 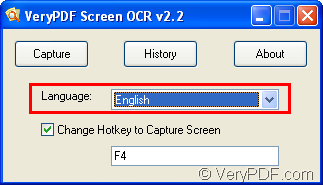 You need to know which kind of language of the text to be recognized and then choose the related language in Language edit box of Screen OCR interface which is shown in Figure 1. For example, you choose the language as English. Then please click Capture button or you can press the hotkey set in the bottom edit box to capture characters on the frozen screen. Please draw a rectangle with your mouse to select the character area to be recognized and then please click OCR button at the bottom of the selected area. Next, the window to recognize text will pop up and it is divided to two parts: The left one is the OCRed image and the right part is the recognized characters. Please see it in Figure 2. In this window, you can see that all the characters in the captured image are recognized accurately to text. If you want to save the recognized text as TXT document, please click File—Save Text or File—Save Text as to save the TXT document in the default directory or specified location set by yourself. So if you have some other questions about how to recognize text from scanned PDF document or about Screen OCR program, you can leave your messages here or ask for help from our support team. 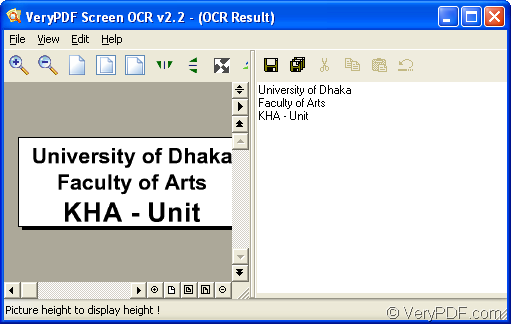 Additionally, to learn more information about Screen OCR, please visit its homepage. This entry was posted in Screen OCR and tagged ocr text, recognize text, scanned PDF. Bookmark the permalink.